The Sun City Shadow Hills development started construction in 2003 and the third and final phase was finished in 2016. Sun City Shadow Hills is currently 100% completed. To purchase a home in this Master Planned community, buyers must find resales from current homeowners within the development. The energy efficient homes vary in size and price. Sun City Shadow Hills has private or golf course lots, many with wonderful views of the golf course, surrounding mountains, and desert landscape. The resale homes are often upgraded by past owners which may result in changes to floor plans. Resale homes in Sun City Shadow Hills typically range from the high $200,000 to over $700,000. The community consists of single-level single family homes, with nearly thirty floor plans behind the gates of Sun City Shadow Hills. 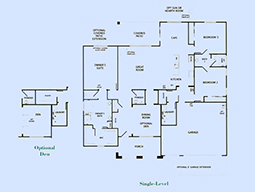 Please see the floor plans for additional details. The monthly homeowner’s association fee, among the lowest in the Coachella Valley, is $265. This provides great value and is very competitive with other Active Adult Communities of its size. These fees provide for state of the art facilities, two championship Golf Courses, numerous amenities, maintenance of the common grounds, future reserve and replacement funding and provides for 24/7 gated security. Residents of Sun City Shadow Hills have access to all the amenities, clubs, and events in the development. Please see the website to view a list of all amenities, clubs, and events.